We’d love your help. Let us know what’s wrong with this preview of Ritorno a Haifa - Umm Saad - Due Storie palestinesi by Ghassan Kanafani. 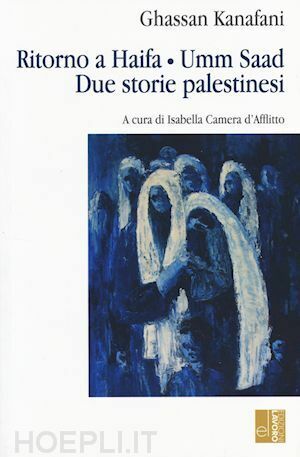 To ask other readers questions about Ritorno a Haifa - Umm Saad - Due Storie palestinesi, please sign up. Ghassan Kanafani was a Palestinian journalist, fiction writer, and a spokesman for the Popular Front for the Liberation of Palestine. Kanafani died at the age of 36, assassinated by car bomb in Beirut, Lebanon. Ghassan Fayiz Kanafani was born in Acre in Palestine (then under the British mandate) in 1936. His father was a lawyer, and sent Ghassan to a French missionary school in Jaffa. During the 1948 Arab-Israeli War, Kanafani and his family fled to Lebanon, but soon moved on to Damascus, Syria, to live there as Palestinian refugees. After studying Arabic literature at the University of Damascus, Kanafani became a teacher at the Palestinian refugee camps in Syria. There, he began writing short stories, influenced by his contact with young children and their experiences as stateless citizens.